With the ignition switch in the ON position, press the CAMERA button or move the shift lever to the R (Reverse) position to operate the Around View Monitor. The monitor displays various views of the position of the vehicle in a split screen format. The Around View Monitor is a convenience feature. 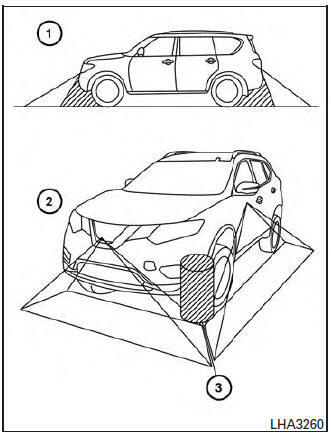 It is not a substitute for proper vehicle operation because it has areas where objects cannot be viewed. The four corners of the vehicle in particular are blind spots where objects do not appear in the bird’s-eye, front or rear views. Always look out the windows and check with your own eyes to be sure that it is safe to move before operating the vehicle. Always operate the vehicle slowly. The driver is always responsible for safety during parking and other maneuvers. Do not use the Around View Monitor with the outside mirror in the stored position, and make sure that the liftgate is securely closed when operating the vehicle using the Around View Monitor. The distance between objects viewed on the Around View Monitor differs from the actual distance. The cameras are installed on the front grille, the outside mirrors and above the rear license plate. Do not put anything on the cameras. When washing the vehicle with highpressure water, be sure not to spray it around the cameras. Otherwise, water may enter the camera unit causing water condensation on the lens, a malfunction, fire or an electric shock. Do not strike the cameras. They are precision instruments. Doing so could cause a malfunction or cause damage resulting in a fire or an electric shock. The surrounding view of the vehicle from above. The view around and ahead of the front passenger’s side wheel. The view to the front of the vehicle. The view to the rear of the vehicle. The system is designed as an aid to the driver in situations such as slot parking or parallel parking. There are some areas where the system will not show objects. When in the front or rearview display, an object below the bumper or on the ground may not be viewed 1 . When in the bird’s-eye view, a tall object near the seam of the camera viewing areas will not appear in the monitor 2 . Do not scratch the camera lens when cleaning dirt or snow from the front of the camera.